“What would you do if you were stuck in one place and every day was exactly the same, and nothing that you did mattered?” Phil Connors (Bill Murray), Groundhog Day, 1993. 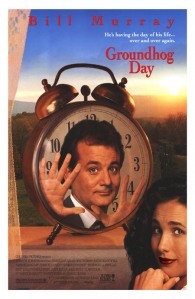 Groundhog Day is one of the top 100 inspirational movies of all time and, in 2006, the film was added to the United States National Film Registry as being deemed “culturally, historically, or aesthetically significant.” Plus, it’s just plain fun. I love this movie; I at once pity and envy the main character who finds himself living the same dreadful day again and again. Today and for the next several days I am exploring my own answers to the question posed in yesterday’s post: What might you learn about your own character from the characters in your favorite movies? This question as well as the movie character theme were inspired directly from Brainzooming, a blog by Mike Brown. Phil Connors is a TV weatherman on a road trip to report on the famous groundhog encountering its shadow – once again – when Phil and his crew are stranded by a winter storm. The character, played brilliantly by one of my favorites, Bill Murray, finds himself living the same strange day over and over again, until he gets it right. My graduate studies were in Speech Communications, but the emphasis was on social psychology and the philosophy of communication from the discipline of existential phenomenology. So perhaps it is no surprise that I love movies that depict existential crises of character, such as this. As much as I appreciate the “Ah-ha” moments of life in which we find special meaning, I also simply love the search for meaning. Phil Connors is pitiful, at first, an egotistical man trapped by his own lack of purpose and values. Yet I envy his opportunity to learn, improve and get it right, all in one day! I relate to his journey of discovering that there is something much more meaningful and powerful than Self. I can only imagine what happens after the movie ends, but we suspect it is a life full of joy because he has learned how to bring love and joy to others. The Egotist has become The Servant. I have enjoyed the mercy of many days and, by the grace of God, more days to come with which I can examine my life, my values, my priorities and my actions to “get it right”. I have the opportunity daily to become less Egotist and more Servant. I have the opportunity to add value through my relationships. I have the opportunity to continue my search “to be remarkable and be a valuable influence in the lives of others… To re-connect [my] thoughts and actions with [my] deepest values and purpose, and engender the same in others.” Of course, these are words I use to describe the blog you are now reading. I relish this opportunity with the same great joy as Phil Connors did when he finally woke up to a new day of love, joy and servanthood. Please join me again tomorrow and for the next few days at The Intersection of Purpose and Now. Together we’ll explore a few more movies and characters. Continue to join me as we explore personal character, values, purpose and all that goes into Personal Leadership. I hope you’ll take time to share your own favorite movie characters and their meaning for you as well. This entry was posted in learning, movies, Purpose, values. Bookmark the permalink.